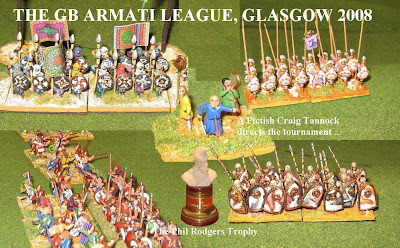 ... and the Armati League's annual 'end of season' get together in Glasgow. 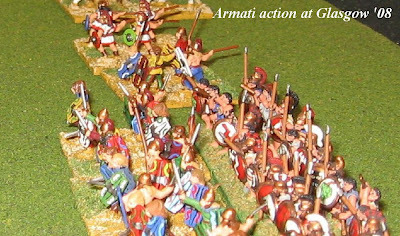 For those unaware, the Armati League formula is of several rounds which are 'open' (limited by period, but the player chooses and takes his/her own army, including bought and obligatory terrain features .. and the game is played per the set up rules etc. 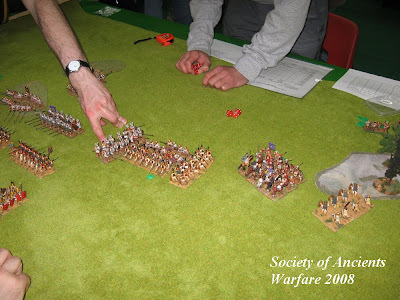 in the book), and several (popularly styled) 'scenario' rounds (where the table and/or army may be fixed and allocated by lot). Traditionally, the last event of the year is in downtown Glasgow a few weeks before Christmas. 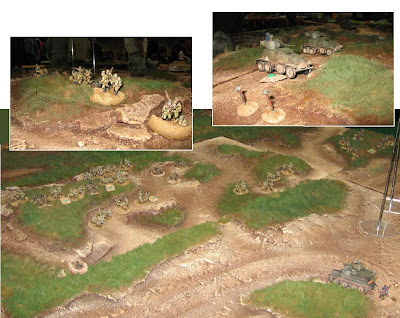 Personally, I do prefer preset terrain for all tournament circumstances as it precludes players turning up with 'cheesy' terrain pieces, it gets games going quickly, and - in my opinion - it sets a more authentic challenge (take the battlefield as it is and the army that you've got ...) ... That said, the terrain on the tables has got to be reasonable, given the armies. And on that point opinions will always differ. Games are allocated by drawing a coin marked with the table number out of a bag, then flipping it to see who gets which side (and a few sub rules to minimise players getting the same game/army a second time round) ... In the past there has been a joker system where players could 'avoid' certain draws by playing their joker and going to the bag again. Great idea. Didn't get used in 2009. The advantage of the joker system is that it enables a player to avoid games that are felt to be unbalanced or which (e.g. me, previously, with Samurai 'civil wars') they don't feel offer a satisfactory game under the rules. Overall, a great effort was put on by Glasgow Phoenix, and most of the games were pretty good matches. 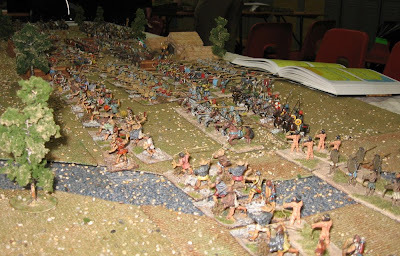 The armies were generally well thought out, and (see the accompanying photos) the presentation standards were great. 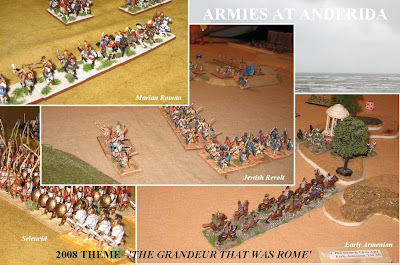 As recorded in Carl Luxford's Newsletter, the tables were as folows: 1 Siatic Egyptian versus Early Achamenid Persian; 2 New Kingdom Egyptian versus Hebrew; 3 Nubian versus New Kingdom Egyptian; 4 Gauls versus Samnites; 5 Seleucids versus Ptolemaic; 6 Fatamid versus Abbasid; 7 Imperial Roman (?) 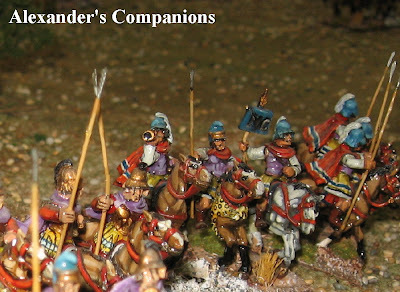 versus Picts; 8 Later Macedonian versus Later Carthaginian; 9 First Crusader versus Nikephoran Byzantines; 10 Ottoman Turk versus Timurid; 11 Catalan Grand Company versus Romanian Frank; 12 German Imperialist versus Milan City State. For the weekend tournament - Steve Metheringham won, Bill Wilson came second, and Vicent Auger came third. The scores meant Bill Wilson retained his crown as Armati League champion for 2009. 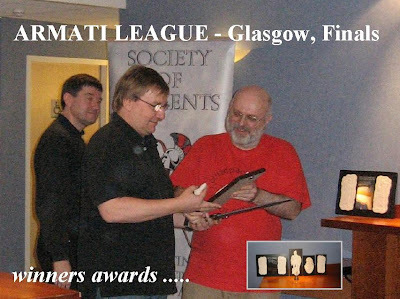 Prominent traditional 'end of season' features of the Glasgow event are the additional awards made by the hosts to their various visitors - once an attempt to share out the prizes this has become something of a ritual mocking of regular players and their likes and dislikes ... much to the entertainment of all. There usually then follows a 'parlement' of the 'League' players to fix the general pattern and provisions for the following year (a clearing house and planning session). Sadly, one supposes due to the waning status of the game, the parlement was called off. Ah well, I suspect this will have been my last Glasgow Armati weekend anyway. The idea, the club and the personalities are great, but the rules are overdue for reform and the game has drifted from what it was in the early days of the league. Nevertheless, thanks for a great weekend and an ideal build up to Christmas ... Best of luck to everyone. 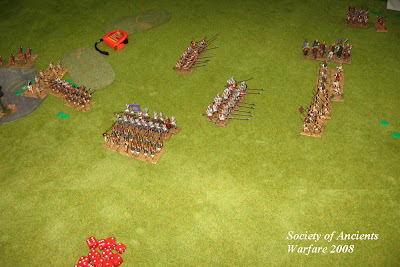 I hope the Society of Ancients continues to support the Armati League. 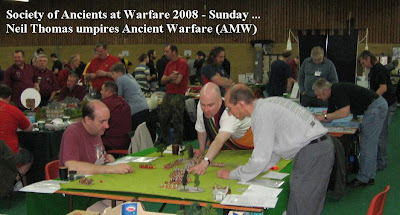 Warfare 2008 The Society of Ancients pitch at Warfare followed a pattern now familiar for shows in the south of England - A Sabin/Cruttenden 28mm historical battle fought as a participation game on the Saturday, changing over to a different game offered on the Sunday. This year was exceptional in that both games were published 'alternative' games, both being run for the Society by their authors (SoA members, of course, as you'd expect ... but seldom are we fortunate enough to get both helping the show team over the course of the same weekend). 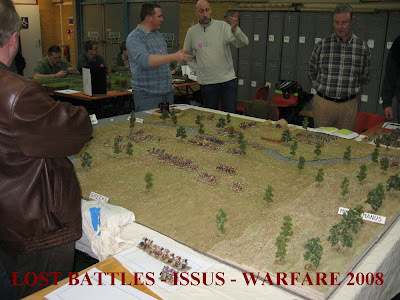 On Saturday, Philip Sabin ran a Lost Battles Issus game. This looked superb and attracted many a compliment. 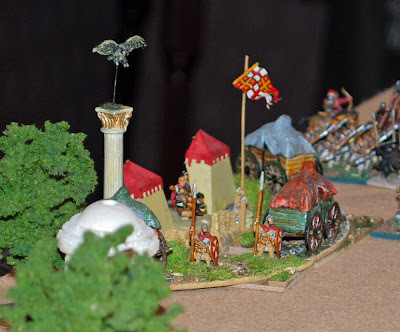 It is also an excellent battle to put on using Lost Battles - huge, and difficult to balance using 'old fashioned' table top systems, it can easily be fought to a conclusion with beginners at the helm, twice in a normal show day. The handicap scoring system enables a fair game to follow the historical script but with plenty of chances to win and change history on both sides. Lost Battles has an interesting way of factoring in the effects of linear features which seems uniquely effective at capturing the essence of these typically Persian battles across the banks of a river. Whilst making the defensive position work challenges the Persian player, Alexander has an absolutely crucial role to play in making the Macedonian army tick ... As well as chatting to a good number of interested spectators and visitors, I was fortunate enough to take a limited part in the second of the day's encounters, and the battle rattled through with its usual smoothness. I really do recommend this system for refighting historical battles of the Classical and Hellenistic period. I believe the paperback is now available. The 'hugely impressive terrain' prize must have gone to the vast 28mm Soviets in Mongolia game (1938, I guess) featuring that currently popular fluffy way of doing long grass - 'fake fur' I think it is made from - which done as well as this, does indeed look very good (and quite Mongolian, I think - I recall there wasn't much to hide behind except dried up river banks and tall grass!) ... Good figures and vehicles too (and - authentically - bi-plane fighters with rocket armament ...)... And another worthy mention goes to the (sadly static) 54mm plastics display .. very inspiring and good to see so many big but inexpensive figures in a simple but effective presentation. I was able to do some good shopping at this show, too. See you next year? Thanks to everyone for giving us so much to do. 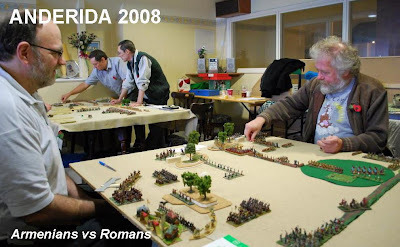 It's a long time since Michael Grant came up with the idea of a friendly late year tournament down on the coast - and the idea that the main prize, the Society's Anderida Trophy, should go to the player that best summed up the event's spirit rather than to the team that amassed the most points. An old-fashioned idea, but one which over the years seems to have kept Anderida an enthusiasts tournament rather than attracted the usual pot-hunters. The welcome and the organisation is old fashioned too - and much the better for it. 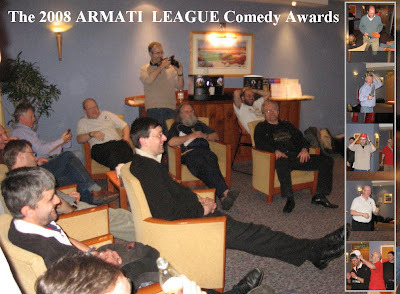 Perhaps I shouldn't have put in the picture of the trophies, though (maybe they are better a 'best kept secret' amongst the Anderida regulars). 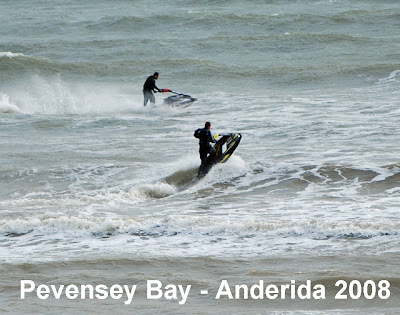 From the beginning, Anderida has been a restricted lists event, with a new idea each year. 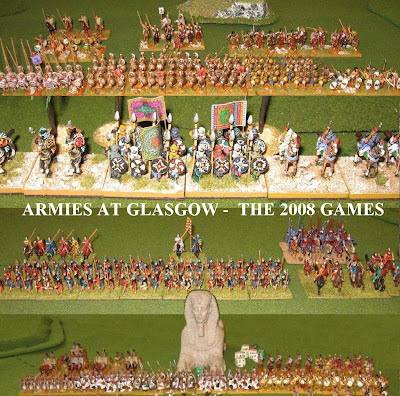 The Best Army and Best Baggage awards are well respected, and many of the teams work for much of the preceding year on the new army for the new theme. It is a pleasure often to be asked as a representative of the Society of Ancients, to scout around and see who's come up with contenders. The final decisions are often very difficult. 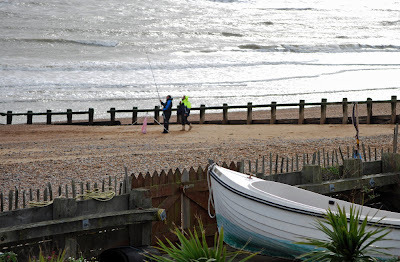 As for the games, for many of us, they are as much a chance to catch up with old friends as to play toy soldiers (and Pevensey Bay's traditionally English breakfasts generally mean a fairly leisurely approach to the day's work is embraced by all ...). This was very much a DBM swansong for me and my SoA Doubles partner, former Treasurer Chris Ager: we have long since both switched and now play Field of Glory for tournaments. Clever little camp vignette - clearly stolen in some time travelling raid on Byzantium, if the flag is anything to go by ... Not the best, though - that went to Barry Harman's assemblage of Hunnic wagons (in contention also must have been the Davies/Parker Roman Marching Camp ... the army itself got the main painting prize ... check out their pictures on the Anderida link ...)..
More important, what a good time we had. Great games all. 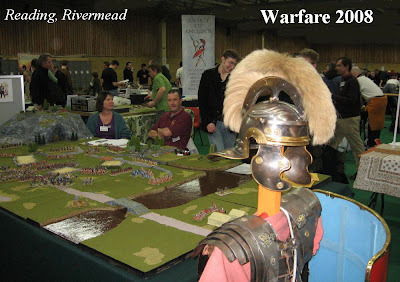 In the end, Chris and I managed to break into the top ten .. level with organiser/hosts Eric and Alan (who seem to spend half their time these days doing Lost Battles displays for the Society at shows as part of Phil Sabin's team ...).. The Society was able to fly the flag (and productively reminded quite a few people to update the subscriptions). And we all did our bit to keep Michael's cherished values going for another year. And yes, we enjoyed playing DBM over the weekend. It made a change. I understand next year will see a choice of either FoG or DBM. Never been before? maybe 2009 will be the year ... Meanwhile here's another of those Pevensey views to sign off with.